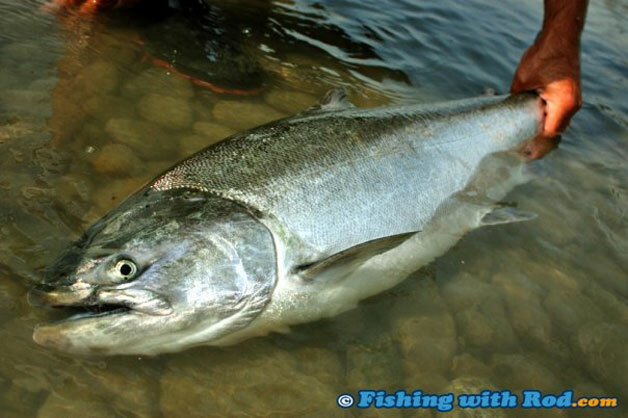 Chinook salmon, or spring salmon, are considered to be the big gamefish in the Pacific salmon family. This is true, these fish can get huge! Since springs are the first salmon that enter the Fraser River and its tributaries, it is usual to see many folks putting their time in on the Mighty Fraser early on. Chinook are said to be hard to catch by many, and you see a lot of people out on the river confused on what to do. Thus, they do not catch any fish for a long period of time. When new anglers figure it out, they will find that it is in fact very easy to bar fish! This is the method which most experienced anglers are familiar with. It seems to be getting more and more popular as the years roll on. In this article, Mike Duncan from Prestige Sportfishing provides an overview on the equipment and setup that you need for the Fraser River bar fishery. He also discusses the timing, spots and other important information that you should be aware of. Mike is a seasoned angler who resides in Harrison Mill. Guiding and operating his company Prestige Sportfishing, he is very familiar with fisheries in the Fraser Valley. Bar fishing is very easy and the setup is simple. Not a lot of equipment is needed. Here is a list of what you need. Rods: You need a good sturdy rod in the 10-12 foot range. The rod should have a 15-30lb line rating, and be able to cast 12-22oz of weights. There are many brands and models to choose from. Popular bar rods are made by Trophy XL, Shimano, Ugly Stik, Daiwa, Quantum, and many more. They range in price from $40 - $175, so you have a wide range in quality and prices. It depends on your preference and budget. You do not want a rod that is too big and heavy, which will kill the fish before it gets to shore, or a rod that is too light and puts too much stress on the fish. Reels: You need a big strong reel that allows you to cast a big weight with ease. It should be able to hold a large amount of line (minimum 200 yards) and have a gear ratio of 4.1 to 5.0. Popular bar fishing reels are made from Penn, Abu Garcia, Shimano, Quantum, and Okuma. All of these reels have different characteristics. The Abu Garcia 7000 is probably the most versatile level wind reel out there. You can chuck lead a mile out there with ease, and it has a good drag system. I have one and love it. Their cost ranges from 175 to 219 dollars. Penn is a more affordable reel. I really enjoy my 310, but the 320 has a little more power for fighting those big fish and can hold a ton of line. The Penn GT2 Series reels run between 120 and 150 dollars a piece, but I find them a little hard to cast long distances with. For spinning reels, I recommend the biggest Okuma reel that you can find, such as the avenger 80. The avenger series runs from about 50 to 130 dollars, depending on model. Remember, you get what you pay for! Line: I recommend running 50-80lb test braided line. Brands to choose from include Power Pro, or Tuf Line XP. Rod holders: You will also need a good bar rod holder. These can be simply made by taking some bar metal, cutting a V at one end and taping on a piece of PVC pipe that is big enough to fit your rod in securely. The holder should be anywhere between 3 to 5 feet long. Use a hitting tool like a sledge hammer to pound it into the ground. A bar fishing setup is pretty basic, which consists of a spreader bar, leader, spin n' glow, hook. Spreader Bars: Tackle stores have these in many sizes and I like to use the 8-10 inch ones, tie on about 4 inches of 50lb test line on the bottom of the spreader bar, attach a snap swivel here. This is for the weight to be connected. Leader: I like to use very thick and non flexible line for my leader. I normally run Maxima Chameleon line in 60lb test. Very thick and strong, it lets the spin n' glow truly spin, as a limp line will often flexes in the water, and can easily be sliced or frayed due to the sharp teeth of a chinook salmon. The average leader length is normally between 12-50 inches. It depends on the depth and type of water you're fishing. Spin n' Glows: There are many different shapes, sizes, and colours of spin n' glows. Spin n' glows used for bar fishing are in the single O and double OO variety. They come in many colours and are completed with one of two different styled wings, which are mylar or rubber. Mylar wings tend to work better than rubber wings. When it comes to choosing the colour of your spin n' glow, there are so many different combinations and options. The most productive ones that I have found are red top with chrome body, green top with chrome body, yellow top with chrome body, and orange top with chrome body. Other good colours are the clown colours (yellow body with red or orange spots), metallic blue, green with black stripes, and red or orange top with a green body. All these combinations have produced fish. My choice depends on the type of water where I fish and its visibility. In dirty water, I use the OO due to the fact that it makes a lot of racket and vibrates like the world is coming to an end. Another trick is to poke holes in the wings of the spin n' glows with a hole puncher, or drill the center of the spin n' glow on a lopsided angle. These tricks, allow the spin n' glow to flop around and cause vibration. Hooks: I like to keep my hook big. The sizes that work best are 6/0 and 7/0. Please remember to pinch off those barbs as you are legally required! On the hook, many people will add roe or another bait to help attract chinook salmon. Scents: Some scents work well as attractants. It is a matter of opinion and what works. Complete Rig: The completed set up should be a spreader bar off the mainline with your weight off the bottom of the bar. From the mid section of the bar, clip on your leader, which should be 12-50 inches long. Your spin n' glow should be on top of 2 to 3 beads before the hook. Add scent or bait onto the hook if needed. Weights: Depending on the river current and bottom structures where you have chosen to fish, you will need to have weights sized accordingly. Fast heavy water could use a 18-22oz weight while slower water could use a 14-16oz. If the bottom consists of big rocks, then use 14-16oz as you will not need as much weight to hold. Be careful when casting these huge weights. If your finger gets caught in your reel or line, you will need stitches. Bells: A bell attached to your rod is needed to alert you when a fish is on! There are many types and brands of bells on the market. The genuine bell shaped ones make a light dinging noise. The round ones are too sensitive and the lightest breeze can make it seem like a fish is attacking your spin n' glow. The best ones in my mind are the small version of the cow bell. They are very Loud, and the noise just makes you want to jump up and yell yahoo as you run to the rod thinking a big one is on, as they are so viciously loud. These ones get the thumbs up, as they are not too sensitive. To place your bell on correctly, you will want a good sturdy clip at the end. These clips come with the bell most of the time. Clip the bell on the 3rd or 4th eye up from the reel on the rod, if you can reach that high. Tie on 6-12 inches of flagging tape in a bright colour onto the bell. When your bell flies off after you set the hook, you can find it in the water easily. You will want to find a spot that has a gradual slope, or has a trough or hole where springs travel or hold. The water should be at least 5 feet deep. You do not want your water to be moving too fast, nor too slow. A fast brisk walking speed is excellent water. This lets the spin n' glow spin freely and perfectly. If the water is too swift then the spin n' glow will spin too fast. On the other hand, it is not effective in slow water as it will barely spin. Mid June to mid September is the period that produces great numbers of both red and white chinook salmon. Late September to late October produces mostly nice white chinook salmon and a few reds, below the Harrison River confluence. Opening dates of Fraser River salmon retention differ from year to year, so you must check the regulations before planning your trip. Matches for fire, if you choose to weeny roast! Remember that bar fishing is a social event! You will be amazed by the types of people who you will meet and befriend out there. Finally, remember that the old timers, who have been bar fishing for decades, are full of tips and advice.